Timeline: 5 Days *Note: For the purposes of this in-class project some constraints and desired features were provided. Client: Party City is an American publicly traded retail chain of party supply stores founded in 1986 by Steve Mandell in East Hanover, New Jersey. Based in Elmsford, New York, the company is the largest retailer of party goods in the United States and Canada, operating over 900 company-owned and franchise outlets under the Party City, Halloween City, and Factory Card and Party Outlet brands. 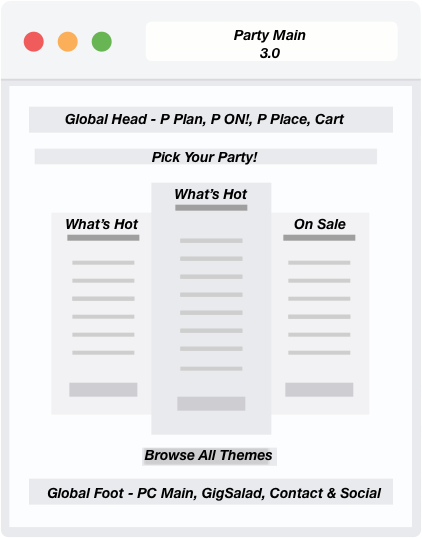 Challenge: PartyCity has hired you to create a website that will help people plan and manage their parties. As a leader in the party supplies, theme decorations, balloons and costumes, PartyCity has decided to expand its services to include additional planning and buying options for its customers. It wants to make it easier for people to organize and pay for themed parties, and to encourage more frequent parties. Outcome: My early survey instrument (demographically geared towards PartyCity's key customer base) yielded valuable findings into what people wanted out of an expanding offering and why. A thorough competitive analysis revealed very well suited rationales as to why and how PartyCity Holdco, INC is/should be approaching their expansion, and led to specific recommendations/strategies for efficient and effective growth. Finally, I designed and deployed a prototype that allowed me to tell the story of where PartyCity could be going with PartyOn! I deployed a day one survey instrument to collect data. Across a well distributed demographic (with slight emphasis on the gross household income segment that PartyCity target as its core customer base) I learned i.) entertainment and food/beverages are seen as significant challenges to those who throw parties and there is a market for those individuals to bring outside vendors in to solve that challenge ii.) which parties are at the forefront of peoples' minds iii.) what define small, medium, and large party sizes and iv.) cost remains a prevalent concern for consumers in this area. In examining the PartyCity HoldCO Inc SEC S-1 IPO Filing I found key statement detailing the planned direction and strategic stances that impact designing the solution of PartyOn! 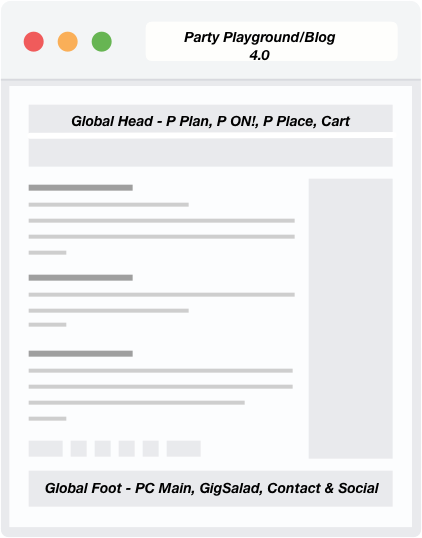 Documented under "Growth Strategy" - "Grow Our E-commerce Platform. Since our e-commerce business was relaunched in 2009 under the PartyCity.com banner, it has grown to account for approximately $100 million in revenue during the twelve months ended September 30, 2013 and, we believe, to become one of the largest e-commerce retailers of decorated party goods and costumes. We are targeting future e-commerce growth by enhancing our merchandising approach online, as well as launching country specific e-commerce sites, building off the 2013 acquisition of Party Delights Ltd. (“Party Delights”). In addition, we anticipate broadening the products and services available to our customers through our e-commerce channel and launching a mobile application." More on this available in the project presentation at bottom of page. I developed persona deliverables based on the scope of the solution. 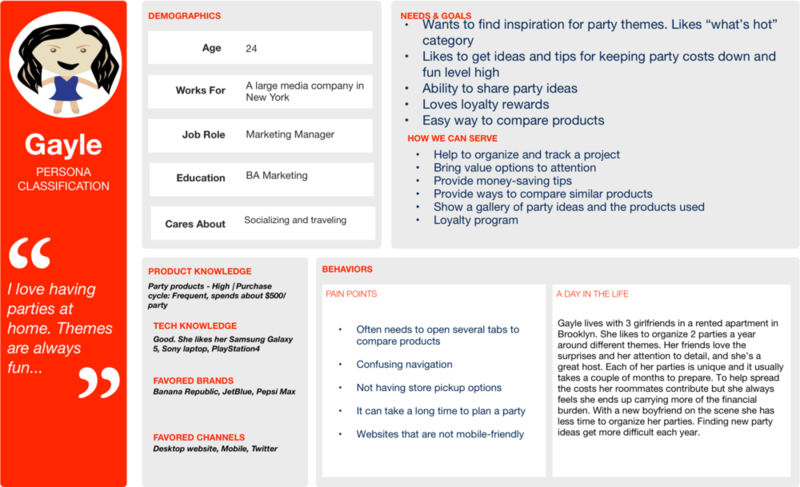 I used journey maps to further ensure that the entire process of interaction with PartyOn! was well considered across the diversified nature of the 3 unique personas. 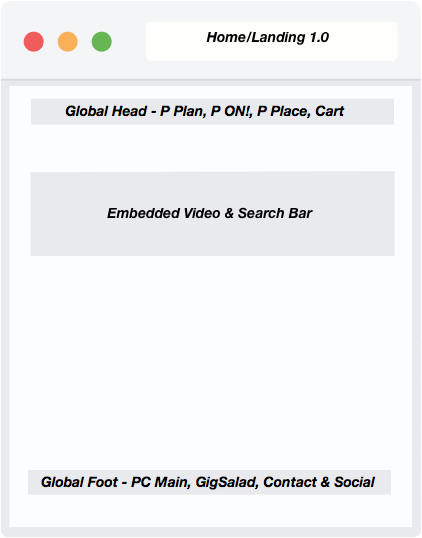 I developed a template system for digital wireframes and then created user flows based to visually examine the flow through PartyOn! I learned that usability testing conducting with the researcher present is delicate. This is a lesson I first learned long ago when exposed to images of 1970's educational classroom behavioral. In these settings it was common for researchers to wear dark black sunglasses, under the assumption that this step would negate the opportunity to make eye contact with those being observed (teachers and students) and thereby avoid a certain level of contaminating the observed behaviors. An elegant, though perhaps difficult to grasp, solution which I certainly witness and relearned, as when in physical proximity to a testing subject they will often default to seeking approval/further instruction if the user's task/direction is not clearly understood and/or not properly briefed to feel confident to proceed on their own. I was first exposed to Usertesting.com (and their current free option "Peek" @ peek.usertesting.com) during this project. I am always seeking to determine speed, cost, precision and other objective measures of testing and research tools and this offering earned note for quick delivery, while having no options for drill down to specific demographics of user testing (understandable for a free service) and also stumbling as its white-list/url filtering protocol was recognizing the unique string assigned to AxureShare urls as being "foreign language" sites and therefore disqualifying my requests to have the sites tested. As of May 2015 this issue currently remained, however by contacting the help/chat operators at Usertesting.com they were always quick to facilitate the request through them individually, with the caveat being that this could not be a sustainable solution long term.